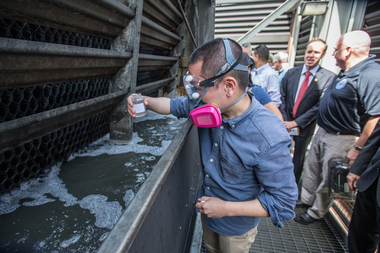 Andy Tse takes a water sample from a cooling tower on the roof of Montefiore Medical Center on Saturday, Aug. 8, 2015. THE BRONX — The city and state will work together to pass joint regulations to combat the spread of Legionnaires' disease, officials announced Tuesday. The City Council was already working on legislation to require all cooling towers, which spread the disease, to be registered and inspected quarterly. Now, the city and the state will craft the bill that will be passed by the City Council and signed into law by Mayor Bill de Blasio. Gov. Andrew Cuomo will then use his emergency powers to put the regulations into effect statewide. "Protecting the public health is our number one priority," Cuomo said in a statement. "I want the people of New York to know that we are doing everything necessary to tackle this outbreak and stop it from happening again. This unified approach will help in this effort." De Blasio said the outbreak, the deadliest in the city's history, required an "unprecedented response." “This legislative action will be the first of its kind for a major American city, as well as the first set of regulations by any state in the union, and it will establish new registration, cleaning and monitoring standards for cooling towers in the fight against Legionnaires’ Disease," de Blasio said in a statement. The city was caught off guard with what is now the largest Legionnaires' outbreak in the city's history, which has killed 12 people and sickened 115. City officials didn't know where all of the cooling towers were located. So far 38 buildings in the Legionnaires' cluster have been identified as having cooling towers. 22 of those towers tested negative for legionella bacteria, which causes the disease, and 11 have tested positive. The city is awaiting results for five more cooling towers. The state has also identified at least three buildings outside of the cluster area that have tested positive for legionella. The news comes as de Blasio and Cuomo continued to bump heads in their long-running feud. On Monday, the two held dueling press conferences and gave out differing numbers regarding how many buildings had tested positive for legionella. When asked about the city's plan to pass regulations regarding cooling towers, Cuomo said there should be a "statewide protocol" to avoid confusion. "I don’t want to have different protocols in different cities so if you own a building in Albany you do one thing, if you own a building in New York City you do something else," he said. De Blasio also struck a similarly defiant tone. "We will take responsibility for protecting our own people," de Blasio said when asked about proposed state legislation. The two men still haven't appeared together since the outbreak. Asked how the city and state were able to overcome their differences, a high-ranking city official said: "All parties decided it was in their best interests." Janet Stout, director of Special Pathogens Laboratory in Pittsburgh and an associate professor of research at the School of Civil and Environmental Engineering at the University of Pittsburgh, has studied Legionnaires' disease for 30 years. Stout said the passage of this law by the city and state make both the leaders in dealing with the spread of the disease in the United States. Other countries such as Spain, Australia and New Zealand have regulations dealing with the inspection of cooling towers, but the United States has lagged behind. "When this many cases occur in a short period of time," Stout said, "it's all hands on deck to bring all the resources to bear." The City Council held a hearing Thursday to discuss their pending legislation. Under the proposed legislation, all cooling towers must be registered with the Department of Buildings and owners must submit a maintenance plan for the cooling towers. The cooling tower water must be tested quarterly. If the water tests positive for legionella the city must be notified and the cooling towers must be cleaned and disinfected by an independent third party. The Department of Health and Department of Buildings will also provide an annual report on compliance and recommend whether to expand testing to other types of equipment.